Washington, DC – The Clark Hulings Fund for Visual Artists (CHF) is excited to announce its Art-Business Conference in the Washington DC metro area, an event that seeks to inspire visual artists to “Conquer the Changing Marketplace.” This weekend-long business- development workshop will give professional working artists the chance to take a deep dive into the business side of their art careers. 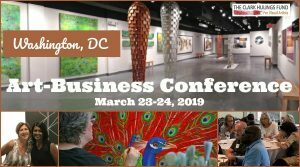 Scheduled for March 23 and 24, 2019, the two-day conference is co-sponsored by Artists & Makers Studios, an art center complex dedicated to providing a supportive and vibrant environment for artists to realize their creative goals. The event manifests CHF’s assertion that “Art is a business and artists should run it.” With the art market undergoing rapid and significant change—not only with regard to technology but also HOW art is marketed, bought, and sold—artists need to reclaim their rightful position at the center of the industry. The Art-Business Conference will help them to take charge of their careers, captivate their audience, maximize the extraordinary professional advantages they already possess and sell their art effectively and profitably. Topics will include building an action plan, creating a brand story, rocking their portfolio, multiplying revenue streams, pricing for profit, selling art online effectively, building a strong support team, squashing resistance, sales strategies, and much more. All sessions are interactive, allowing artists to work together and engage conference leaders with their specific business questions. The program will be led by Elizabeth Hulings, CHF director and co-founder; Carolyn Edlund, CHF sales director, and events manager; and Daniel DiGriz, CHF education director. “With a vibrant gallery scene, museums attracting visitors from around the globe, and unparalleled public art, we are thrilled to deliver tangible business skills and training in this exciting market, and to partner with Artists & Makers Studios.” says Hulings. The event fee is $395, but CHF is offering an extra early-bird price of $295 until January 15, and an early-bird price of $345 until March 1, 2019, when the regular price of $395 starts. Tickets are available here. In addition to conference admission, ticket holders will receive one year of “Colleague”-level access to CHF’s Business Accelerator Portal, a comprehensive online learning and community resource for working artists. The Clark Hulings Fund for Visual Artists (CHF) is a 501(c)(3) nonprofit organization that champions economic sustainability for working artists. We do this by delivering business education and entrepreneurial learning through a rigorous Business Accelerator, a Digital Learning Portal, in-person education events in local communities, and a federation of artist-formed and artist-led networks of opportunity. All of this work achieves one aim: equip visual artists to thrive as self-sustaining entrepreneurs.